I can’t claim to have invented this gem but I know it will be changing healthy Moms’ kitchen status all over America! A friend’s Aunt made this for our Canadian Thanksgiving celebration last week and she was wonderful enough to write it out for me. Thanks Denise! 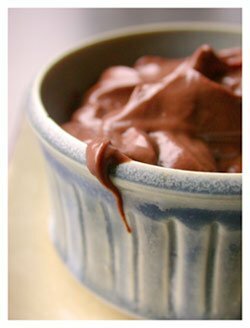 4 ripe Avocados, 1 cup Cocoa, 1/2 cup Maple syrup, 2 Tbsp. Virgin Coconut Oil, 2 Tsp. Balsamic Vinegar, 1 Tsp. Soy Sauce, 2 Tsp. Vanilla. Blend everything up in a food processor and serve. I promise even your Avocado-haters will LOVE this.